A rectangular huanghuali stand, supported on straight legs at the four corners. The top has a marble panel inset in the top of the mitred mortise-and tenon joined framework. The marble top has streaks of grey markings in a mottled grey-white ground, resembling a traditional Chinese ink painting with windswept, foliated peaks rising from mist. The legs are joined by square-section hipped stretchers and are supported on four small curved feet. A line of inscription written in red reads ‘L46.10-4’. 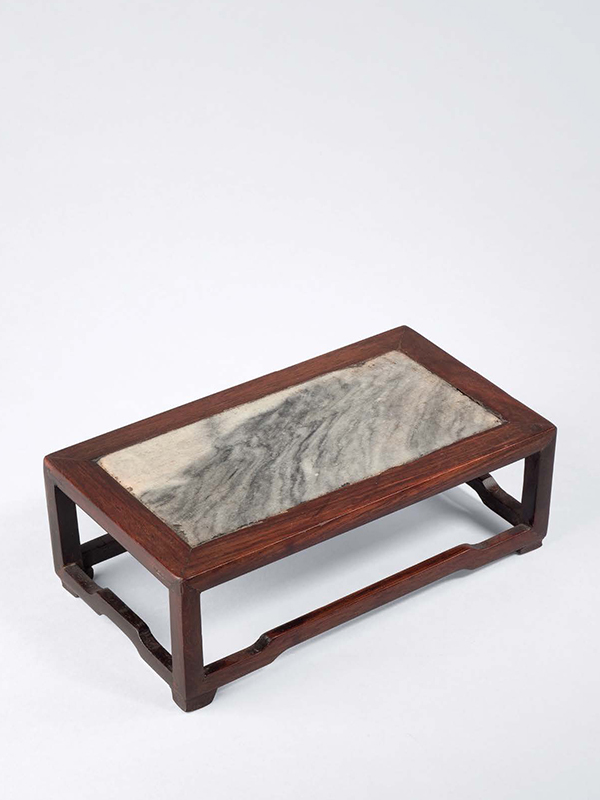 This miniature stand, resembling a low rectangular kang table, has a marble top with a landscape-like pattern that immediately grips the eyes of the viewer. A Song dynasty painting by Liu Song-nien (1174 – 1224), Five Scholars of Tang, depicts a high-waisted painting table with an inlaid stone top. It is likely that this small stand was used for burning incense and for supporting the ‘Three Friends of Incense’ – an incense tool vase, incense burner and incense powder box. Its marble top, known as a Dali marble in China, would have been resistant to accidental damage from burning incense sticks. Small and portable, it could be used to display incense paraphernalia in the scholar’s studio or taken outdoors for use. The connoisseurship on Dali marble is represented by Wen Zhenheng of the late Ming dynasty: “Dali marble is produced in Yunnan (province), White as jade, black as ink…. If one can obtain old stone with naturally formed landscapes with clouds and mists like Mi Fu’s landscape, these are unsurpassed in excellence.” A wood stand of comparable form and with the ‘Three Friends of Incense’ is illustrated in a late Qing gouache painting published by Beurdeley in Chinese Furniture. There are two comparable 18th century wood stands, both inset with a marble panel: one similarly made of huanghuali in the Vok collection is slightly larger in size ; the other made of zitan is similar in proportions and in the collection of the Minneapolis Institute of Arts.